Description: One of the most familiar shorebirds, the Killdeer is a robin-sized plover with two complete dark bands across its neck and chest and pale legs in all seasons. A bright red eye ring is visible during the breeding season. The orange-brown rump is obvious as the bird tries to lure intruders from its nest or chicks with a “broken wing” distraction display. 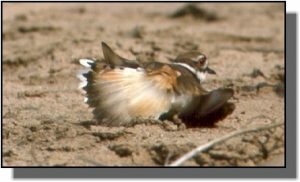 Historically called the Chattering or Noisy Plover, the “killdeer” call is distinct. Similar Species: The double breast band on this plover is diagnostic among the plovers found in the region. Downy Killdeer young show a single breast band at hatching. However, by the time they have attained juvenal plumage at about 17 days, they sport both bands. 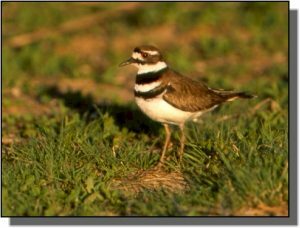 Comments: Killdeer are found during the breeding season throughout the Great Plains in short grass habitats, agricultural areas and mudflats. 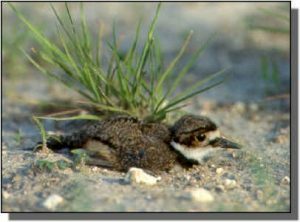 Gravel is a preferred nesting substrate and Killdeer are often found nesting along roads. They winter from the southern Great Plains through northern South America. Migrants are seen throughout the region.